Report says: Situation "Matter of serious concern"! 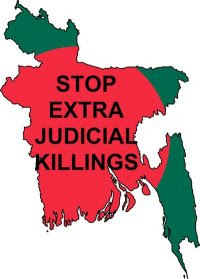 By Bangladesh Media; Human Rights Report 2010 for the glove has been released by the State Department of USA, which describes the situation of Bangladesh is a "matter of serious Concern"! Foreign Minister of Bangladesh Dipu Moni reacted as "not authentic"! The summery of the report says that security forces committed extrajudicial killings and were responsible for custodial deaths, torture, and arbitrary arrest and detention. The failure to investigate fully extrajudicial killings by security forces, including several deaths in custody of alleged criminals detained by the Rapid Action Battalion (RAB), remained a "matter of serious concern". Some members of the security forces acted with impunity. Prison conditions at times were life-threatening, lengthy pretrial detention continued to be a problem, and authorities infringed on citizens' privacy rights. An increasingly politicized judiciary exacerbated problems in an already overwhelmed judicial system and constrained access to justice for members of opposition parties. The government limited freedom of speech and of the press, self-censorship continued, and security forces harassed journalists. The government curbed freedom of assembly, and politically motivated violence remained a problem. Official corruption and related impunity continued. Discrimination against women, and violence against women and children remained serious problems, as did discrimination against persons with disabilities and against persons based on their sexual orientation. Trafficking in persons remained a serious problem. Violence against religious and ethnic minorities still occurred, although many government and civil society leaders stated that these acts often had political or economic motivations and could not be attributed only to religious belief or affiliation. Limits on worker rights and child labor remained problems. To read the full report click here! The foreign minister has termed 'not substantiated' the US State Department's human rights report on Bangladesh. "Sources of the report are weak and analysis is not properly done," Dipu Moni said at a press briefing at the ministry Monday. They collected information from newspapers, NGOs and other private sources, which are not very authentic, she claimed. Dipu Mono will say anything. She is a lier and non professional.